Colortime Crafts and Markers Review by Deb Klein | Colortime Crafts and Markers - Glow in the Dark Halloween Tote Review! 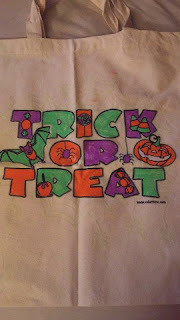 We recently had the opportunity to review the Glow In the Dark Halloween Tote from Colortime Crafts and Markers. And let me tell you~this is one Cute Tote! As soon as my grandson saw it he could not wait to get started on it. 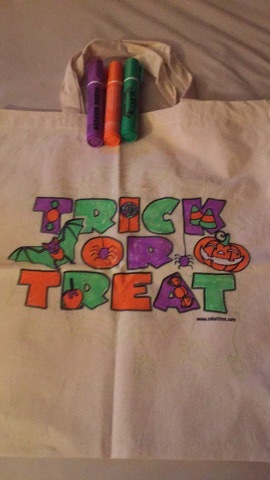 As you not only get the tote but also 3 markers to color it. So nothing else is needed! He took it in the kitchen to work on and before I knew it he was done. The colors look perfect on it and the fact that is glows in the dark is a added plus. As he plans on taking this out with us on Halloween to go Trick or Treating! It was so easy to color and I like the fact that you can just wash this if it gets dirty to keep it looking like new. Great for kids of all ages as they can color it any way that they want to make it their own. And the price is right so you will be able to get one for each kid in your family! You can see this and more at Colortime Crafts and Markers as there are other things that they carry too that are kid friendly.